My chocolate coconut butter bars are made with simple, whole food ingredients and organic chocolate chips. Make them next time you’re craving something sweet. You’ll be pleasantly surprised! 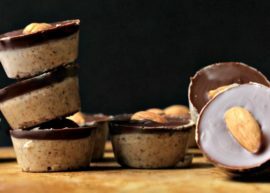 Want a healthy treat that isn’t full of junk? I got one for you! Meet my newest creation, The Chocolate Coconut Butter Bar. These little bars are made with coconut butter, raw honey, vanilla bean and soy free chocolate chips. That’s it! They’re so easy to make, it’s dangerous! You may need to keep these ingredients out of your home just so you’re not tempted to make them daily. You are warned. Step 1: Melt coconut butter in a small sauce pan over low heat. Add vanilla and sweeten to taste with stevia, honey or maple syrup. I added about 3 tablespoons of honey to this batch. 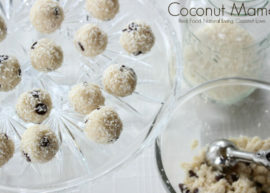 Pour the coconut mixture evenly into each square. 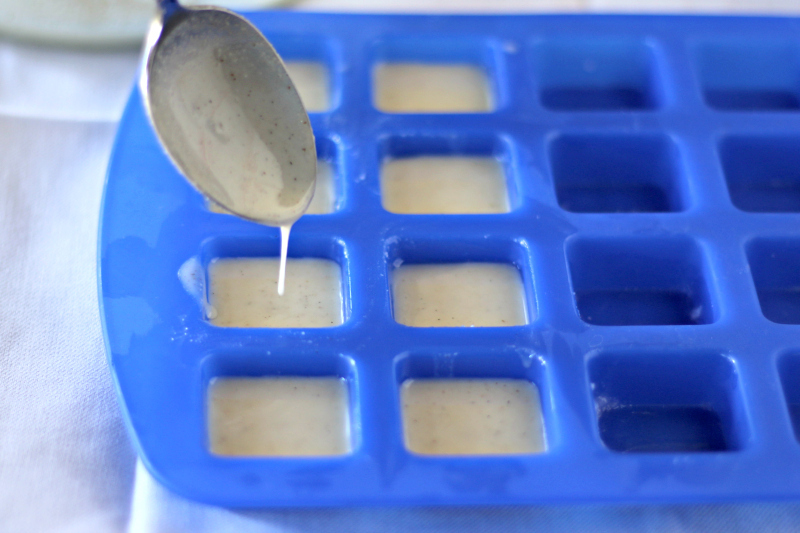 Step 2: Freeze the bottom layer of the bars for 15-20 minutes or until the coconut cream is completely frozen. Step 3: Next you’ll need to melt the chocolate chips…. Step 4: and then top the cold coconut bars with a layer of chocolate. Step 5: Return the tray back to the freezer for 5-10 minutes or until the chocolate is set. Then pop them out of the molds and eat them up! Melt coconut butter, vanilla bean powder and sweetener (I used 3 tbs of raw honey) together in a saucepan over low heat. 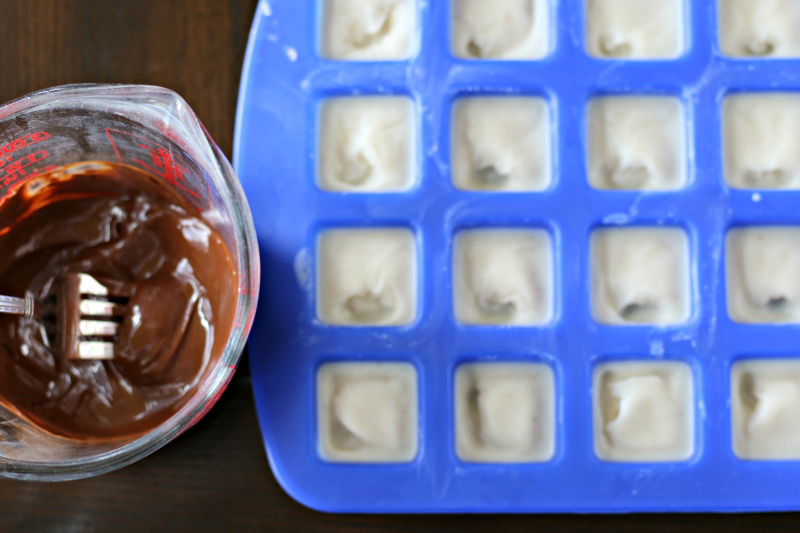 Pour the melted coconut butter into the square molds, making sure to only fill them 3/4 full. 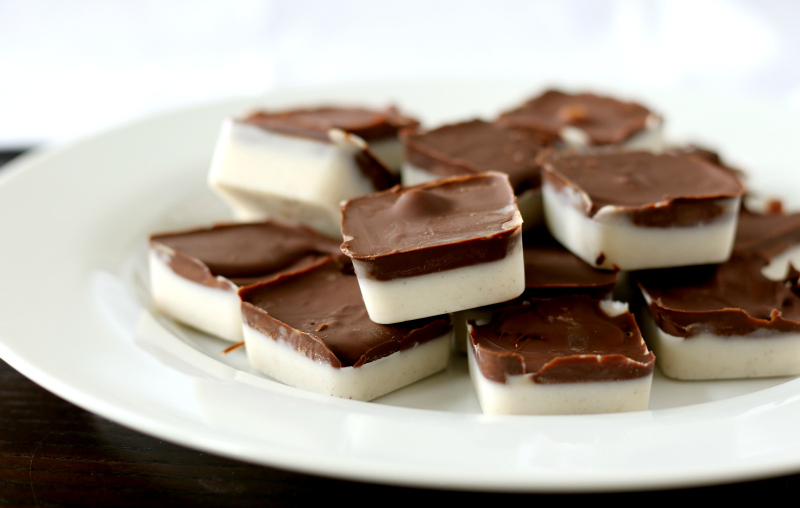 Freeze the coconut bars for 10 minutes or until the coconut butter is solid. 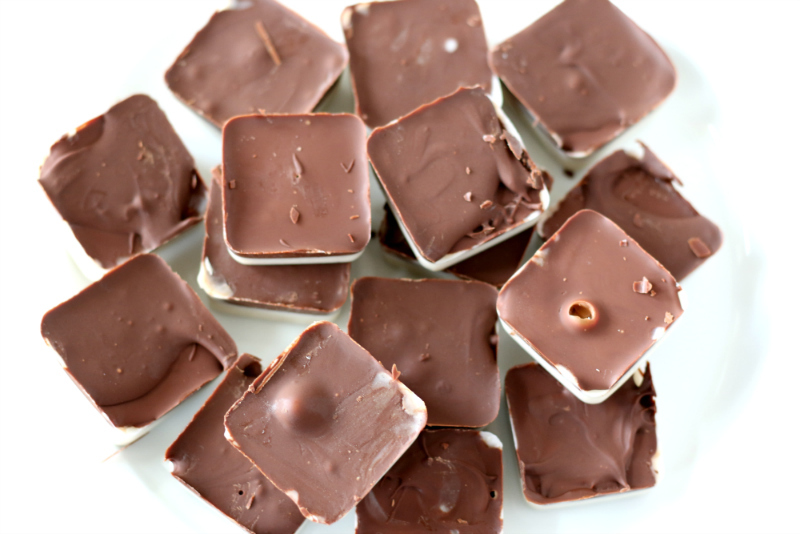 Next, melt the chocolate chips and carefully pour the chocolate over the cold coconut butter squares. 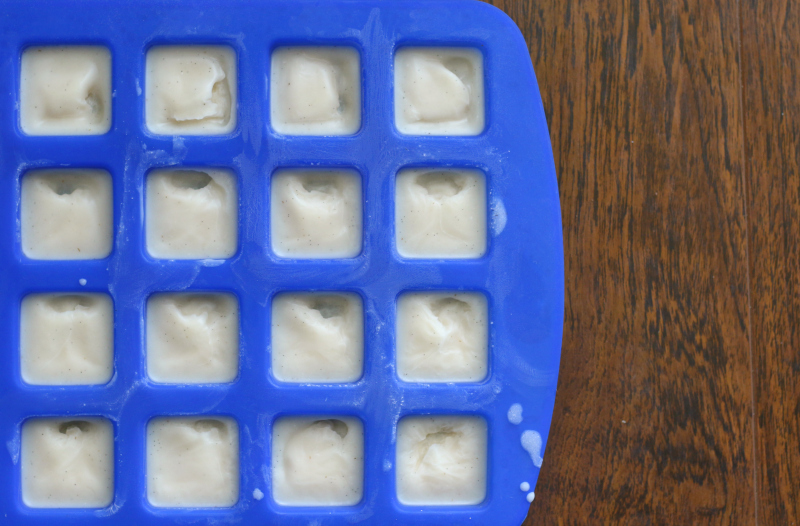 Place the tray back in the freezer to set, approximately 8-10 minutes. 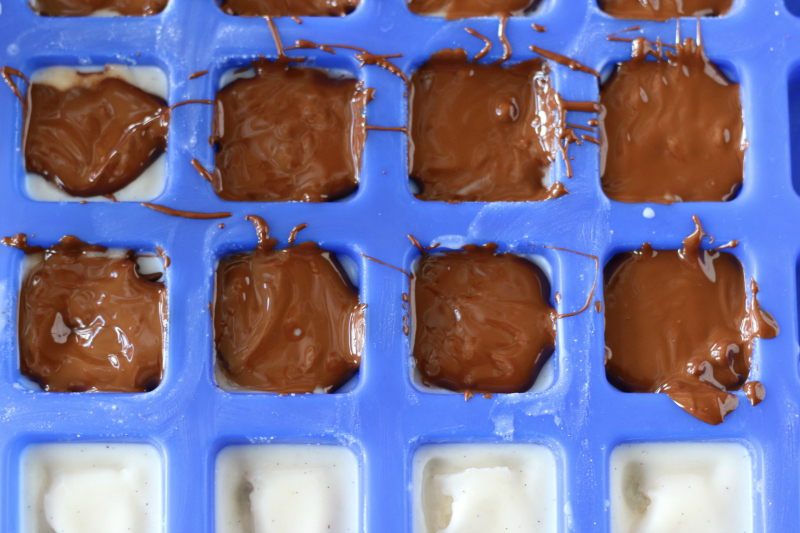 Pop the chocolate coconut butter bars out of the mold. Store extra bars in a container in the freezer. I can’t find vanilla powder in my city & want to make them for Easter so I can’t wait for online delivery. Can I substitute the powder for vanilla pod seeds or extract? Vanilla seeds will work in this recipe. 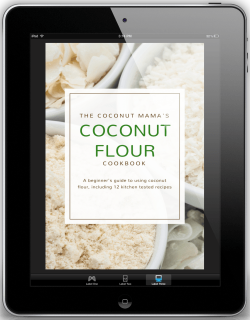 Vanilla extract doesn’t mix well with coconut butter, so I wouldn’t use it in this recipe. Has anyone added some nut butter to the mix? Sounds like that would be kind of a Reeses bar. These bars sound fantastic. I’m pinning it. These look amazing Tiffany! Homemade healthy chocolate treats are the best.. I’m so exited to start making my own coconut butter, just need to get a good food processor that’s strong enough. Tried these today. Had to melt coconut butter in microwave jar to stir. Melted fine in microwave but then when I transferred to pan to mix in vanilla and honey it turned hard. ??? yes, the same happened to me, as soon as I added the maple syrop it went hard, so I added coconut flakes and pressed it into the bottom of a cake pan and it worked well. How about a recipe with white choc instead? Choc is too bitter for me. Can you substitute cacao butter? Please post nutritional facts…especially total carb count for those of us who are diabetics. Thank you. I tapped on the product links that went to Amazon this takes you to each product individually. Scroll downto the sellers description and you can see each ingredient and it’s full nutritional information listed. I made these chocolate butter bars today and they are amazing. I added walnut pieces to the top before putting them in the refrigerator and WOW. 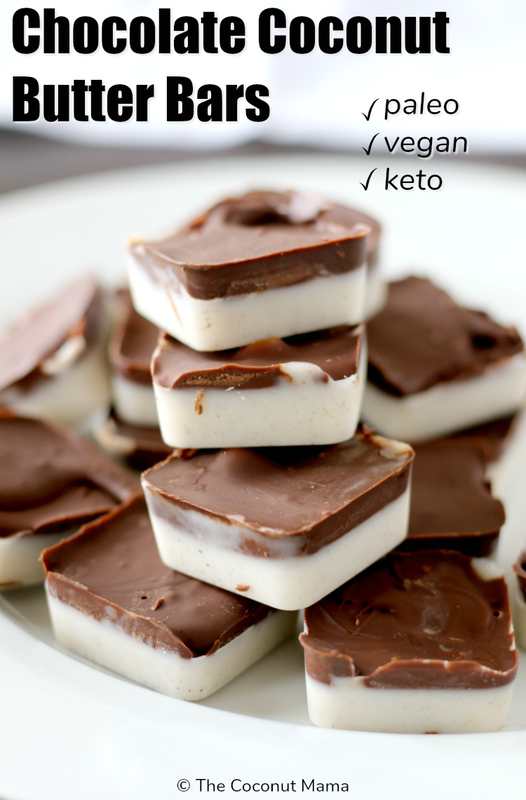 My husband loved them and thought they tasted like almond joy bars. Thank you!!! So glad I found you…I’m taking 1000units of organic virgin coconut oil daily.. Do I need a higher dosage.. Please guide me! Really, really appreciate your contributions to good health!!! Do we know the fat content of these coconut butter, chocolate bars? The other day I bought a coconut that had been in the ‘reduced’ rack. It had no liquid in it. I cleaned it and tried to make coconut butter. I bet I have close to an hour of blending time! I finally gave up. What I have is something like a dry mush… if that makes any sense. I thought of you when I read Coconut oil increases growth hormones. I am putting together a healthy diet plan for my co workers, and will be including lots of coconut oil. Thank you for writing your blog. The chocolate coconut butter/manna bars: recipe says pour chocolate over the pan – is this a typo or do you flip the pan over and pour on the outside?? Sorry to be confused. how high of speed in your processor to you need to make coconut butter , is 500 watt high enough ? Where to buy the square mold ? My coconut butter didn’t melt on the stove so I nuked it so it would spread easier. What Heat are you using? Is coconut butter different from coconut manna? MMMMMmmmm Good! And you’re correct. too much of a good thing is over indulgence!!! Can I use cocanut oil instead of coconut butter? I tried them tonite and same result. Coconut butter would not melt. Just softened to a dough like consistency. I just took spoonfuls and pressed then into silicone mold and topped with chocolate. Very tasty I’ll say. No, coconut butter is very different from coconut oil. coconut butter (Melrose brand) did not melt? I’m from australia and both coconut butter and oil are available here. It seems from this thread other people have trouble melting it.Is there a trick? Could you tell why coconut butter did not melt. The 1st I made them it did melt but this time it didn’t. I too could not melt the coconut butter. It was Artisana organic coconut butter. Nevertheless, I’m sure they’ll be delicious. I simply pushed the coconut butter onto the chocolate and placed it in the frig. Can’t wait! Thank you for your website! I love it! can u post a nutrition count? OMG! That recipe sounds soooo yummy! What do you think to add some raw coconut nectar instead of honey or maple syrup? 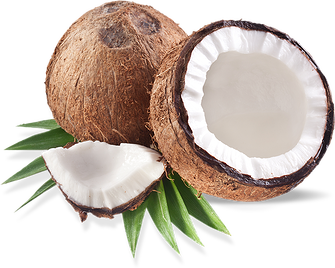 I llike coconut nectar because it’s low glycemic and it doesn’t give me the sugar rush . Gosh.. i love these! Cant eat enough of them! How long has it been heating? You may want to turn up the heat a bit. What brand of coconut butter are you using? I’m using artisana brand and it won’t melt either! I’ve done it on low heat and medium and nothing is happening. I made my own coconut butter and it did not melt either, when I turned it up it turned brown..but still put it together. See how it is for dessert..
mine didn’t melt either (used nutiva coconut manna) – i just pressed it down on to the chocolate and stuck it in the fridge – soooo good!